StumbleUpon lets you discover the web through its “Stumble!” button. Now StumbleUpon has released its Best of StumbleUpon 2011 list, including the below infographic and its most popular links of the year. 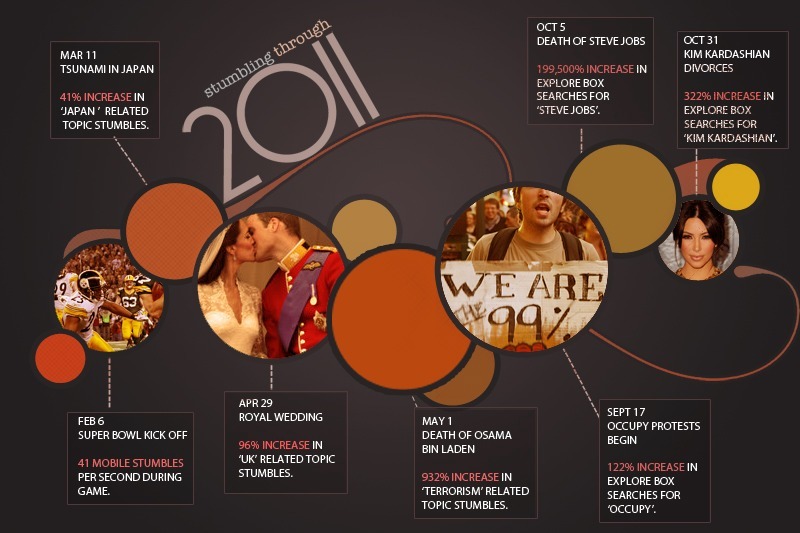 The most-popular topics of 2011 were the Japan earthquake and tsunami, the Royal Wedding the Steve Jobs‘s death. In fact, following Jobs’s Oct. 5 death there was a 199,500% increase in searches for the Apple co-founder. During the Super Bowl, there were some 41 mobile stumbles per second, which is not surprising given that 80% of people multi-task on their mobile devices while watching TV. The most popular links included quotes from Albert Einstien, street installations of Mark Jenkins and a humorous list of how to tick people off. Some other highlights for the site in 2011 include reaching 20 million users in October and a redesign in December.